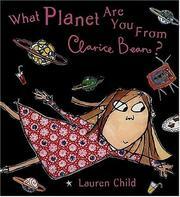 Children's Picture Book Database at Miami University | What planet are you from, Clarice Bean? What planet are you from, Clarice Bean? Child, Lauren, “What planet are you from, Clarice Bean?,” Children's Picture Book Database at Miami University, accessed April 25, 2019, https://dlp.lib.miamioh.edu/picturebook/items/show/13923.